One of the highlights of this year’s conference, as it is every year, was the Biodiesel Vehicle Showcase Event, where vehicle makers gave us a sneak peek at what’s coming from them that runs on biodiesel. 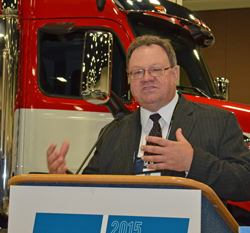 Steve Howell, the National Biodiesel Board’s (NBB) senior technical advisor, said when the industry started more than 20 years ago, they had a very modest goal of producing 30 million gallons of biodiesel nationwide annually. Now, an average plant cranks out that much each. He credits working with partners in the automaking industry for the increase.